Let’s start with a story: This past November, after the Brewers had succumbed to the Dodgers in the NLCS, I went to Milwaukee for a weekend. After shouting the requisite “Hello Wisconsin!” when crossing state lines, I went straight to a brewery because really, what else does one do in Milwaukee besides brewery tours? This particular brewery had a deal: For twelve dollars, you were gifted a three-hour tour window in which you could have any full beer of your choice and unlimited half-beer refills. The only catch was you would have to double back to the bar during the tour to get your refills. Pause: Something I’ve noticed since Moneyball seeped deep into the public consciousness is the proliferation of the phrase “the new market inefficiency” to describe any team’s confusing strategic endeavors. The Rays’ “opener”? New market inefficiency. The Royals’ bullpen of death in 2015/2016? New market inefficiency. The Yankees home-run happy, remade Murderer’s Row lineup? Neither new nor inefficient but you better believe it’s been described that way. Resume: During this brewery tour of mine, I discovered the same market inefficiency that the actual Milwaukee Brewers exploited this offseason. If you stay at the bar longer than everyone else, you’ll get a better deal. For twelve dollars and one sacrificed lesson on how to make beer, I managed to get my personal cost-per-glass under $2. I’m not proud of it except I really am. For one-year contracts of $18 million and $10 million, the Brewers added a consensus top three catcher (their weakest position) and an above-average third baseman respectively. They aren’t cheap, but for a one-time offer only, the Brewers got a whole lot better for 2019 and sacrificed nothing. Loitering by the bar as everyone else moves toward the newer, shiner things: A new market inefficiency indeed. Exploiting market inefficiencies isn’t the sole purview of the 2019 Brewers; the 2018 club did it too. Borrowing from the 2015/2016 Royals’ blueprint for success, the Brewers rode a bullpen of death all the way to Game 7 of the NLCS. Josh Hader, Jeremy Jeffress, and Corey Knebel were the three horsemen of the final nine outs, riding in to finish games once the Brewers had a lead after six. That’s the fairy tale version of the Brewers’ 2018. In reality, the Brewers rode breakouts by Christian Yelich, Jesus Aguilar, and Wade Miley. Lorenzo Cain quietly had an MVP-level season, but he was overshadowed by the actual MVP. Travis Shaw proved his production from 2017 wasn’t just a fluke, which most of the industry assumed it would be. And finally, picking up Gio Gonzalez for the stretch run brought a proven, league-average starter into the mix. The Brewers were solid top to bottom, they just had the luxury of an unparalleled bullpen too. The Brewers beat up on the bad teams as they should (42-20 against sub-.500 teams) and held their own against the good ones (54-47 against over-.500 teams). They were a legit contender bolstered by a stars-aligning scenario that came just a game short of their second World Series in franchise history. There’s an argument to be made that the Brewers had the best offseason of any major league team by virtue of value to production. Yasmani Grandal plugs the 2018 Brewers’ most glaring hole and cost pennies compared to what pundits expected he would be worth. Likewise, bringing Mike Moustakas back on an extremely affordable contract keeps the Brewers in the conversation of best lineup in the NL Central. However, as my mom is fond of saying: being frugal is fine, but don’t skimp when you absolutely need something. And guess what, the Brewers absolutely need pitching. Losing Gio Gonzalez, Wade Miley, and their pitcher whisperer Derek Johnson to our hometown boys hurts the Brewers immensely. As it stands, the Brewers rotation goes Jhoulys Chacin and four “insert name here” slots. Jimmy Nelson won’t be ready for Opening Day. Brandon Woodruff, Corbin Burnes, and Freddy Peralta are all young and unpolished, but will start the year in the rotation with Zach Davies. Presumed rotation mate Chase Anderson has been relegated to the bullpen. Should one of the three young guns falter in the early going, Anderson can be expected to return to the starting corps. Luckily for the Brewers, a man named Dallas Keuchel still lacks a job and what’s the point of being frugal when you absolutely need something? The Brewers system is, um, how do I say this….thin? Thin, yeah, that works. The Wisconsin team have Keston Hiura, a second baseman who sure knows how to hit, and then a bunch of guys far, far from the majors. Baseball Prospectus ranked the system 29th in baseball, but ESPN’s Keith Law was a bit more kind ranking it 25th. Either way you slice it, the Brewers have a narrow window it seems, and it’s closing pretty quick. That’s not to knock Keston Hiura though because the 22-year-old looks every bit of the real deal. Baseball Prospectus wrote, “he could be a perennial .300 hitter with a few 20-home-run seasons mixed in to boot,” which is not a profile to scoff at. FanGraphs thinks he can be an All-Star second baseman. And pretty much everyone agrees he’ll probably make his debut this year. Of the top 10 Brewers prospects, three are in Rookie ball, two are in Single A, and one has yet to play a professional game. Hiura, Corey Ray, and Mauricio Dubon carry the bats while Zack Brown just won Minor League Pitcher of the Year in AA. Outside of Hiura though, all three of the guys close to the majors carry huge question marks about their ability to be anything more than a fringe 25-man guy. Ray has the most potential of the three but strikes out far too much and doesn’t play great defense up the middle. 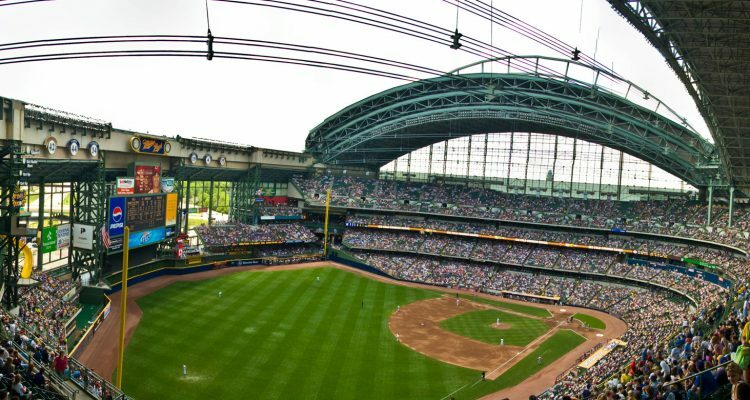 There’s a lot to like about the current Brewers on-field product, but unless this system replenishes soon, it’ll get dicey two, three years from now. Photo Credit: Bryce Edwards. Photo was slightly altered. Licensing can be found here. Honestly, If I was up there, and they don’t blow the world away in the first half, I would start a rebuild. The pitching is atrocious, the bullpen is making the rumor circuit on the UCL damage news. The team is one Yelich injury away from being last in the division. As noted the Farm is currently not good. I admire what they did last year, but that was last year. An unhealthy team in this division should have virtually no chance at the playoffs. Looks like the Brewers bullpen took a big hit yesterday with the announcement that Corey Knebel has a UCL elbow injury. Jeremy Jeffress was injured earlier in spring training and will begin the season on the IL. No wonder the Brewers have been connected to free agent reliever Craig Kimbrel the last few days. They need Kimbrel more than they need Dallas Keuchel. If they sign Kimbrel and bring him in, I would look for the Brewers to roll the dice on their rotation until July. One of their young starters, Woodruff or Burnes, will emerge to lead their rotation until July. Both are good, young pitchers. I think the Brewers are going to regret trading Domingo Santana to Seattle. He already has hit a grand slam that counts. In one of those games in Japan that were just completed. With the rise of Aguilar at 1B and an OF of Braun/Cain/Yelich, Santana was expendable. They probably should have traded Braun to LAD as was rumored and kept Santana. Hopefully, pitching coach Derek Johnson’s departure will end up being their biggest loss on the off-season. Someone needs to steal Kimbrel from underneath the Crew. Preferably outside of the NLC if it isn’t the Reds. Was the brewery you toured Lake Front? Their offense looks fine, and bullpen terrific (when healthy), but that rotation is a huge question mark. The AA pitcher of the year sounds very promising (Luis Castillo-style?) so maybe Zack Brown can help out. And perhaps Woodruff or Barnes will indeed emerge. But if not, this team could definitely struggle. The Cubs, Brewers and Reds will all go as far this year as their starters take them. Amazingly, I’m optimistic about the Reds rotation being the best of those three in 2019.